This week sees the release of the hilarious, Seth Rogen and Evan Goldberg-directed apocalyptic comedy This Is The End, but don't think that spells the end for R-rated summer comedies in 2013. Previewed in late May when both the red and green band trailers arrived online, director Rawson Marshall Thurber's pot comedy We're The Millers looks like it could be a late-summer hit, and looks as though it's filled with a lot of laughs. 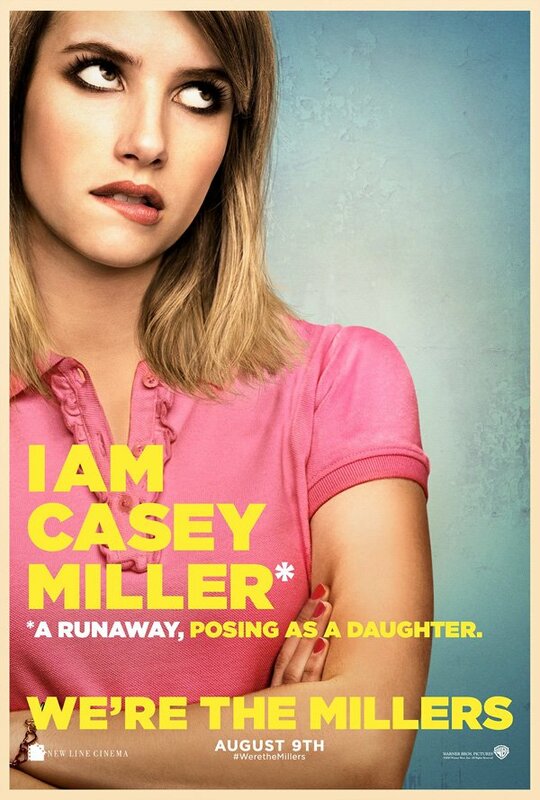 The cast for the film is terrific, with Jason Sudeikis and Jennifer Aniston headlining, and comedians like Ed Helms, Nick Offerman, and Katheryn Hahn playing supporting roles, but today we get two character posters for the younger actors in the movie. The We're The Millers official Facebook page has launched two new one-sheets for the new comedy highlighting stars Emma Roberts and Will Poulter. In the film, Sudeikis stars as a low-level pot dealer who runs into money issues and hesitantly agrees to smuggle some marijuana across the Mexico border into America. In order to pull off the job he decides to rent and RV and hire a woman and two young people to play his children. As you can see in both of these new posters, Roberts and Poulter will be playing the "kids" in this scenario, and seem to have very different attitudes. Presumably this is just the start of a week-long release of new character posters, so in the next couple of days expect to hear even more about We're The Millers. And considering the comedy is being put out by Warner Bros. - the same studio releasing Man of Steel - I wouldn't be too surprised if we saw a new trailer this week as well. We're The Millers will be in theaters on August 9th.